When No Man’s Sky drops a big update, I tend to wander around the world wondering what’s changed. Was the grass always this lush? Is the water the same color? Have the bushes always been purple? Visions, the surprise update dropped on Thanksgiving, has many of those kinds of subtle changes. But my favorite part of it is the Community Event, which isn’t about noticing what’s different. In Visions, this event is all about working together with the other people who share this world. After some time analyzing my home planet and deciding no, I don’t think the bushes have always been purple, I set off for the stars to try to see some of the other new content in No Man’s Sky. Almost immediately I got flagged by Specialist Polo, a character who serves as a mouthpiece for Hello Games to tell players about Community Events. Previously, Community Events were all completed individually, with individual rewards. This one, which is new with the Vision update, has players all contribute towards a shared goal that will unlock tiers of rewards for everyone who participates. This time, Polo wants players to scan vegetation, and to start, he needs you to go to a certain planet and scan the flora there first. Soon after getting that message, I found a portal and made my way to Polo’s special planet. It took my breath away. I have never in my life seen this many communication modules. As I walked past, I read greetings from other players. “Hello from Germany!” “Hello from UK!” Someone had their mic on and audibly gasped upon their arrival. Then I actually looked at the planet. It was gorgeous, strange, truly alien. Trees shaped like downed airplanes floated in the air, just kissing the ground. Tentacled plants began to glow after sunset. The only form of life to be found was a skittering sentient rock, cascading across the landscape. There have been very few moments in games where I feel as if I’ve truly been transported to another world. Yesterday, in my apartment, I momentarily forgot about the confines of the real-life walls around me. I was adrift, at space, an explorer in an unknown land, surrounded on all sides by my allies. This new kind of community event seems designed to serve the way that the No Man’s Sky community already operates. Players form fictional nations and outposts, then combine their efforts externally for a common in-game goal of exploration and civilization-building. Specialist Polo isn’t asking players to build a nation, but reminding them that they share a universe and all their actions contribute it. 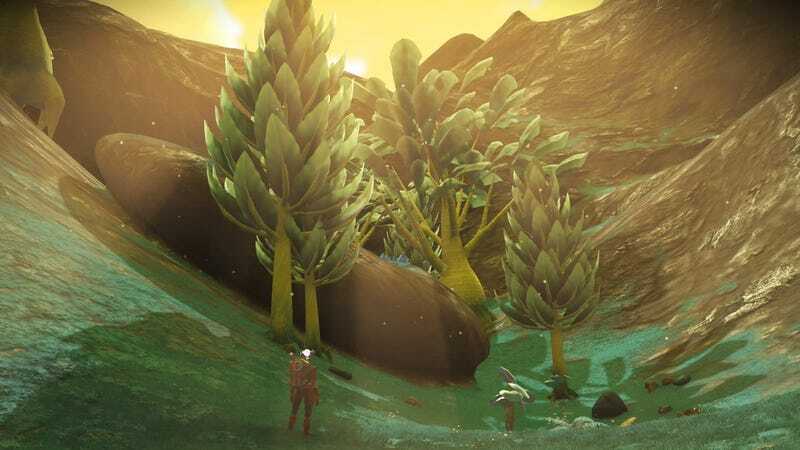 After you leave this bizarre and beautiful planet, any plants you scan will count to the community goal. Most No Man’s Sky updates have generally more things. They offer changes to the biomes, new systems to juggle, or they rejigger the economies. Those are useful and needed changes, but something about Visions makes me want to spend more time with No Man’s Sky, rather than just dipping in to see what’s new. I’m interested in the ways that this game brings people together, and I’m really excited to see Hello Games lean into that.